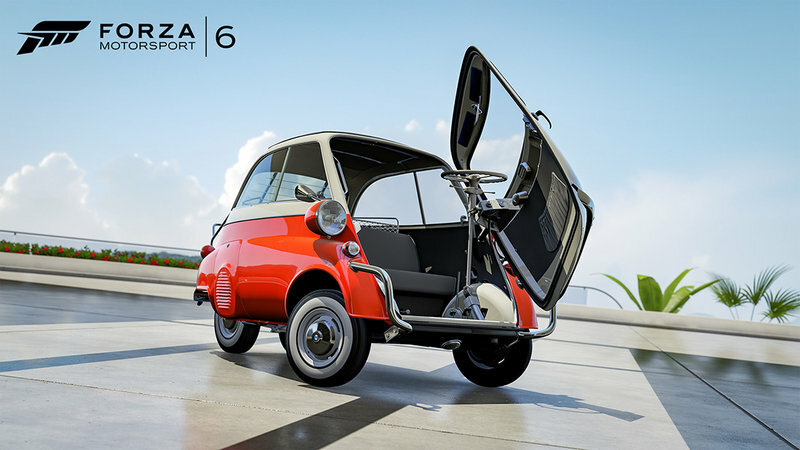 Turn 10 Studios’ latest car pack for Forza 6 features arguably the most eclectic choice of cars that the developer has included as a downloadable content for the racing game. First of all, it doesn’t have an overarching theme like the NASCAR Pack or the Hot Wheels Pack. It’s called the Turn 10 Select Car Pack and the collection of cars included here is as mixed and varied as they come, including the 2015 Mercedes-Benz #24 Tankpool24 Racing Truck that has a knee-buckling 1,080 horsepower on tap. Sure, the McLaren 570S Coupe is the face of this pack, and rightfully so since it’s the most exotic car on the list. But let’s not kid ourselves into thinking that we’re going to drive anything other than the Tankpool24 Racing Truck when we get our hands on the pack. That and the 1957 BMW Isetta 300 Export because of the simple fact that it would be a hoot to get on board the iconic microcar and racing it without having to worry about hurting ourselves doing it. But that Tankpool24 Racing Truck is on a league of its own, literally and figuratively. In addition to the truck, the 570S Coupe, and the Isetta, the new Turn 10 Select Car Pack also features an old school roadster in the 1980 Fiat 124 Sport Spider that’s been recently revived by Fiat, and a collection of mouth-watering race cars that includes the 1969 Ford Brawner Hawk III, the 2014 Jaguar #14 Emil Frey GT3 Jaguar XK, and the 2014 Chevrolet #4 ROAL Motorsport RML Cruze TC1 WTCC. As is always the case, the whole pack is available for just $7, or if you only want to get one or two of the cars, an option to purchase them individually is also available. Continue after the jump to read the full story. I think it goes without saying that this new car pack from Turn 10 Studios is one of the most interesting ones the developer has come up with for Forza 6. I know I’ve said something similar in the past, but it really feels like Turn 10 upped its game with this pack. It’s such an interesting pack that the McLaren 570S Coupe, regarded as the face of this DLC, just might be the fourth or fifth most interesting car in the whole thing. I can make a case that the race cars are more interesting than the 570S Coupe. The Ford Brawner Hawk III, for instance, took home the checkered flag at the 1969 Indianapolis 500 with Mario Andretti at the wheel. Then there’s Emil Frey team’s Jaguar XK racer, which has a long and storied partnership with the British automaker. Finally, there’s the #4 ROAL Motorsport RML Cruze TC1 WTCC, arguably one of the most successful cars to compete in the World Touring Car Championship. I can’t forget about the Fiat 124 Sport Spider and the BMW Isetta either. These two cars may not have the performance of their contemporaries, but for the sheer pleasure of racing them in the setting of Forza 6, that’s bound to get the juices going. Last but certainly not least is the most interesting car of the pack: the Mercedes-Benz #24 Tankpool24 Racing Truck. I don’t think anybody’s going to need to do a lot of explaining or any convincing to take this 1,080-horsepower mastodon out for a spin on the game. I know myself well enough that when the DLC is ready to be played, I’m making a beeline for the Tankpool24 race truck.